Even after beating analyst estimates, offshore drillers Seadrill and Transocean carry risk that investors need to keep in mind. I own shares of offshore driller Seadrill (NYSE:SDRL) and I'm pretty positive on the long-term outlook for Transocean (NYSE:RIG). Both companies recently reported quarterly earnings that were in line and above most analyst expectations, and Seadrill even increased its already-huge dividend by a couple pennies. However, even with the positive news, and my positive view on the outlook for both of these companies, I think it's worth exploring the very real risks that lie with investing in these two big players in offshore oil and gas drilling. 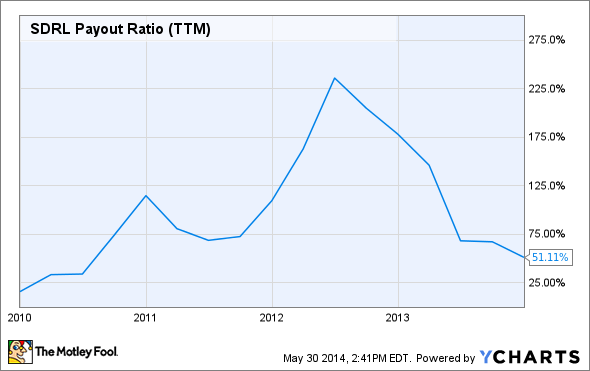 Would a Seadrill dividend cut in the next couple of years be a disaster for your retirement? If so, you may want to diversify your exposure. Source: U.S. Coast Guard. Am I selling? No, I'm not; but maybe you should. Let's take a closer look at why. The expected demand for offshore drillers is likely to be soft over the next couple of years, but the reality is -- as I and others have pointed out -- the offshore market is really made up of two components: traditional legacy ships, and high specification ships. While there's little doubt that demand for these legacy ships will be down, there is expectation that demand for ships that can operate in deeper and more hostile water, and can drill deeper, will be relatively strong. Transocean has seven drillships under construction, but only one goes online by 2015. Source: Transocean. On the surface, this indicates that Transocean, with its massive fleet that has a lot of older ships, is most at risk, while Seadrill, with its shiny new fleet that it's adding as many as 19 ships to over the next several years, is well-positioned. While this is largely true -- though Transocean's downside is probably less than it may seem -- my concern is that many investors are going into the next couple of years as if this is simply a binary outcome situation; i.e., Seadrill will do well, while Transocean won't, and that's just not the case. There are reasons, however, to believe that some of our major competitors will accept rates levels for a sixth generation vessels in the $425-$475k level. Currently, the market suffers from limited exploration drilling and delays in field developments from the major oil companies ... Oil companies are trying to determine when dayrates will trough, thus are not compelled to sign contracts if they feel dayrates are still declining. Once a leading edge is defined, others tend to be compelled to award contracts. To this point, in the recent weeks, we have seen increased inquiries by both majors and independent operators following the establishment of a leading edge dayrate. Seadrill's newbuilds will have a lot of competition over the next two years. Source: Seadrill. In short, oil companies are both delaying investment in offshore drilling and waiting to see if dayrates will fall further. The risk for Seadrill is a larger number of newbuilds coming online at a period where there isn't quite enough demand, even in the high specification segment of the market. Of the 68 drillships under construction, 11 are Seadrill's, and eight of those are scheduled to come online in 2014 and 2015. Lastly, the global fleet of drillships is 106, with 98 of those deepwater or ultradeep. By the end of next year, there will be another 35 in operation -- in the middle of a soft demand cycle. 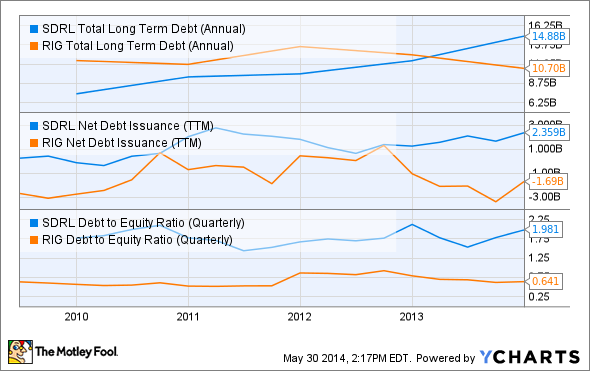 SDRL Total Long Term Debt (Annual) data by YCharts. As you can see, Seadrill has added a lot more debt, while Transocean has actually paid its down. Most importantly, look at just how leveraged Seadrill is, with a scary-high debt-to-equity ratio. What this tells me is that, while Transocean's older portion of its fleet may suffer from lack of demand, the company is much, much less leveraged than Seadrill. And this high leverage could create a double-whammy. Simply put, demand for drillships alone needs to grow by more than 30% over the next 20 months just to support newbuilds. If it doesn't, Seadrill could see dayrates get pushed down, and its utilization rates fall at the same time that its debt costs increase when newbuilds are delivered. SDRL Payout Ratio (TTM) data by YCharts. Anyway you slice it, Seadrill's high debt load has supported the dividend in the past. Sure, it's not taking out loans to pay the dividend, but if it weren't paying a dividend that's more than double what its peers pay, it wouldn't need to take on so much debt. It's good to see the payout ratio falling below 100%, but as debt grows, dayrates and utilization rates must remain high as well. As I wrote above, I'm not selling my Seadrill shares. As a matter of fact, I could see myself buying more, or buying shares of Transocean. That's because I'm still 25 years from retirement, Seadrill is only 1.5% of my portfolio, and I don't own shares of any other offshore driller. It's about my level of risk, timeline, and total exposure to the industry. If you're heavily exposed to offshore drillers, close to retirement, and will depend on income from these companies in the next few years, you should at least consider rebalancing your exposure. I can live with a bad couple of years for offshore drillers. Can you? If not, maybe it's time to sell off part of your Seadrill or Transocean shares.